As some of you know, the NDDC has been doing the “Be Local” ads for several years. This year, we’re partnering with the Chamber in what is loosely called the “Be Local…Buy Local” campaign. This month, our message is “Be Local…Dine Local”. NDDC Board Member Anastasia Balfany designed the image for the Northfield Entertainment Guide ad. It’s a plate that’s ready for your order…in downtown Northfield. 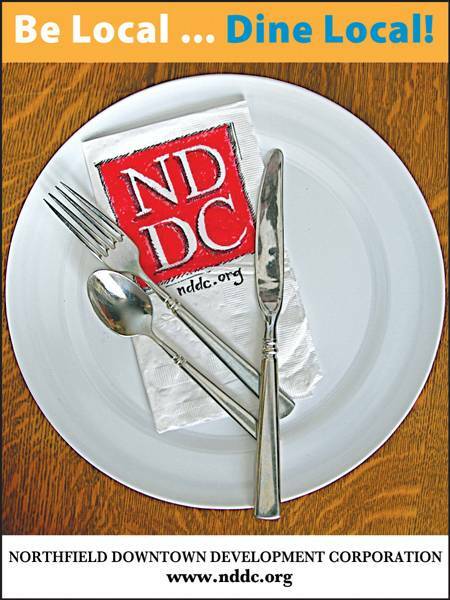 We consider ourselves fortunate to have over two dozen dining options in downtown Northfield. They include B & L Pizza, Basil’s Pizza, Bittersweet Eatery, Goodbye Blue Monday Coffeehouse, Butler’s Steak & Ale, Caribou Coffee, Chapati, China Buffet, Contented Cow Pub, Domino’s Pizza, Eagles Club, EconoFoods, Froggy Bottoms River Pub, Hogan Brothers Acoustic Cafe, J. Grundy’s Rueb’N’Stein, James Gang HideAway, Just Food Co-op, Mandarin Garden, Quality Bakery & Coffee, Quarterback Club, Subway, Taco Bell, The Tavern, Tiny’s Dogs All Day, and the VFW Club. The weather’s getting better; it’s safe to come out of your “cabin”. Come on down(town) this month and Be Local…Dine Local.